In the ESL department at our school, we try to combine CCSS standards with the WIDA standards of Reading, Writing, Speaking, and Listening in every class period. I can do that easily with my higher proficiency students, but am struggling to get in the writing with my Newcomers. I've been trying to get them to expand their sentences (this from students who in September couldn't tell me their names! Crazy!) from "I go outside," to "I go outside and play ______." That is a slow process, but I have been using something called LEA, or Language Experience Approach to help me out. When I saw this Pin on Pinterest, I was Pin-spired, and knew I had to do it with my own class. 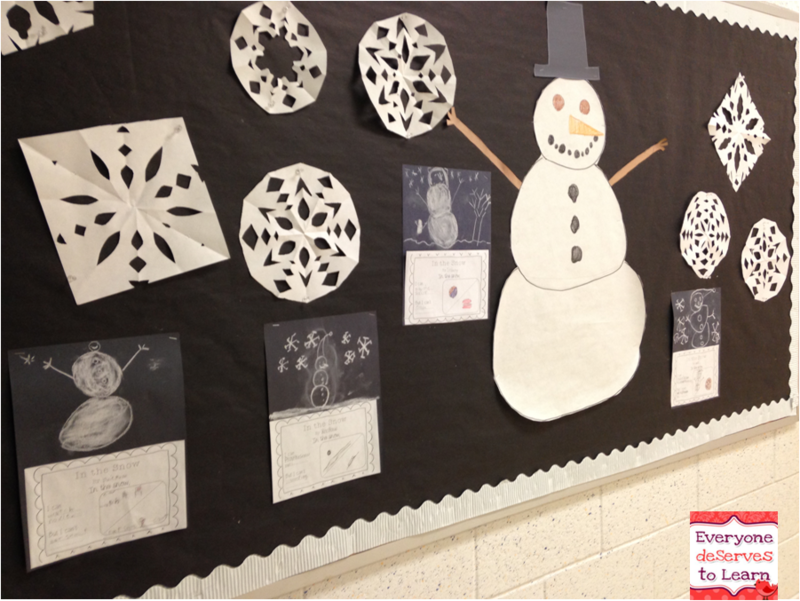 With all the snow we've had recently, they had plenty of background knowledge in what they can and can't do in it, and it provided a great segue into a little bit of poetry! I created an anchor chart based on the Pin, with space for each of my students. 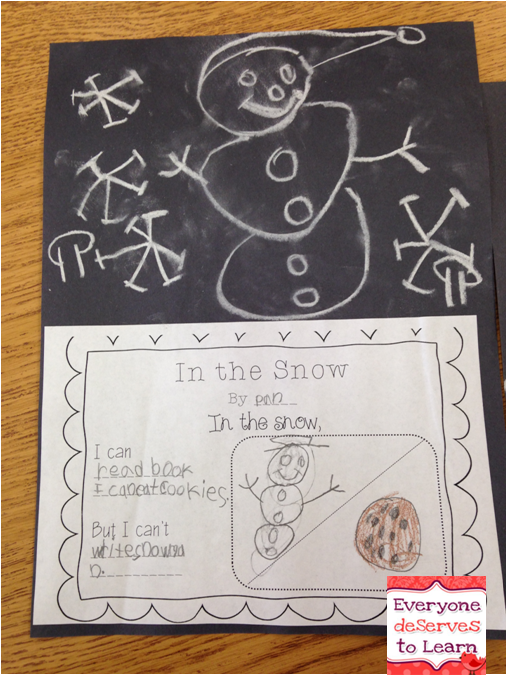 (Don't mind the Cookie Jar anchor chart!) Then I projected this little poem up on the board and talked about how a poem is a very very short story that is only on one page. I told them that sometimes a poem has words that sound the same (we haven't done rhymes yet- still working on vowel sounds/digraphs). We read it together and I asked very simple questions on their level, such as "What is falling? Rain or snow?" "Is it loud or quiet?" "Can you hear it?" "Can you see it?" Sometimes with low-proficiency students it helps to give them a "choose your answer" question, which is usually the case for us. We are working on answering in a complete sentences ("I can see the snow," "It is quiet,") so even though the Common Core Police would put me in Complexity Jail, the WIDA Defense Attorneys would get me out. 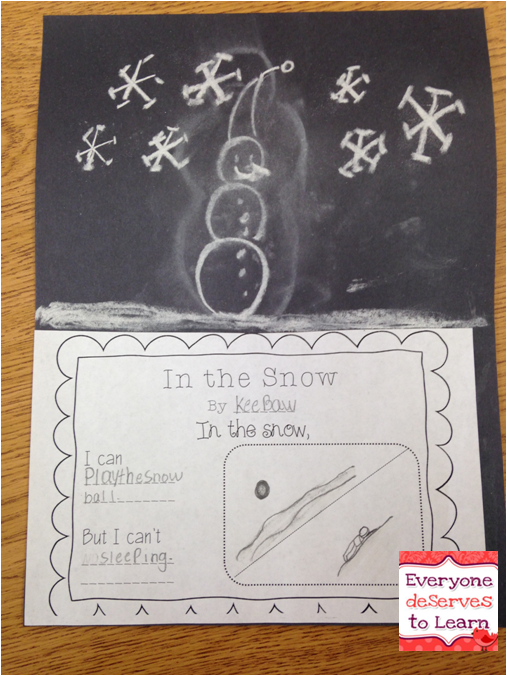 Once we practiced our fluency, we began to write our own snow poem. I modeled what my can and can't would be, then I took their suggestions and wrote them on the board. ESL Tip: When you are practicing LEA, it's important to write down exactly what the student dictates, even though it's grammatically incorrect. For students who are insecure about their speaking, changing what they say can make them less likely to produce language the next time you ask. In LEA, the students dictate what they want to write, the teacher writes it, then the students read it back. The theory is that if you can say it, you can read it. In this, that was true 7/8 of the time. 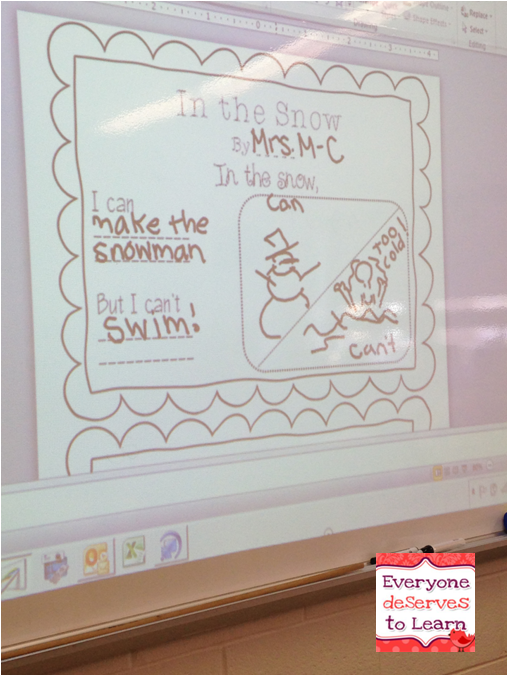 My one exception was my 1st grader, who chose to tell me, after much 7 year old deliberation, "I can't write snowman." I prompted her for a different choice but she stuck with that one, and even after much repetition she was unable to remember her "I can't", though she could read her "I can" words. 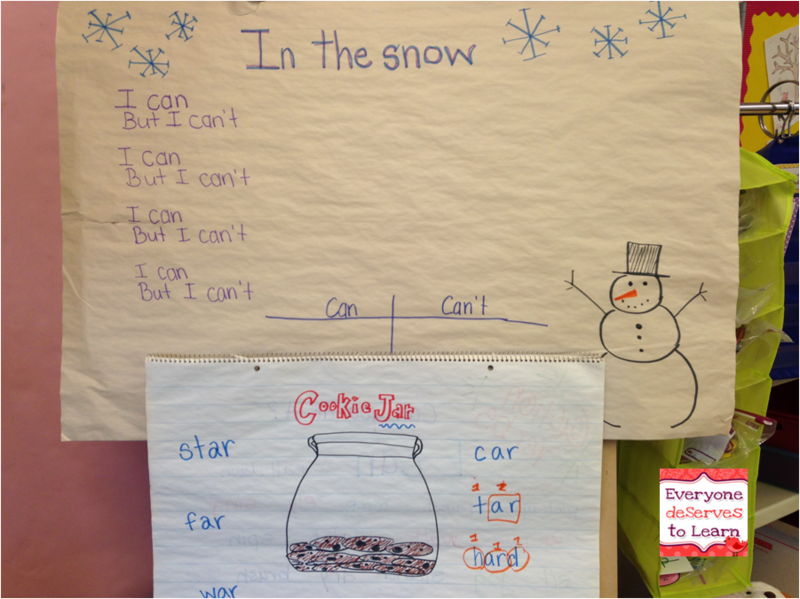 When we finished sorting our can's and can'ts, we moved on to the individual writing piece. I just moved my easel closer to the table to make it easier to copy- some students still have trouble with one to one correspondence. Here are some finished projects! Aren't they cute? 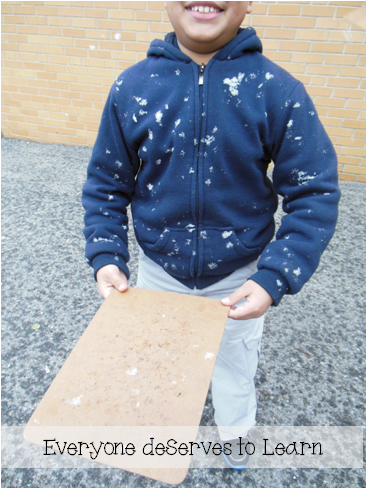 I had them draw the snowmen with chalk, and when I set it on the table, their eyes went wide. They told me that in Thailand their teacher used to write with chalk. I know they are often homesick, so I was happy to let them have this little bit of home for a few minutes. 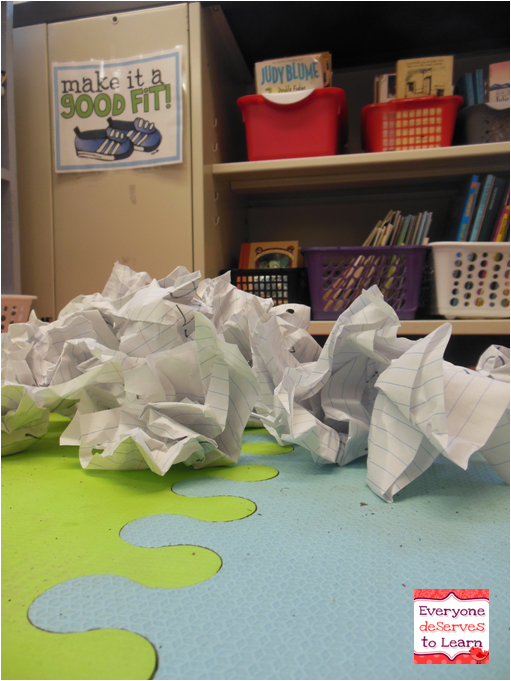 We hung them on the bulletin board outside, then each student read his or her poetry to the rest of the class. It was a great lesson and a wonderful way to incorporate writing, and all because of one pin! 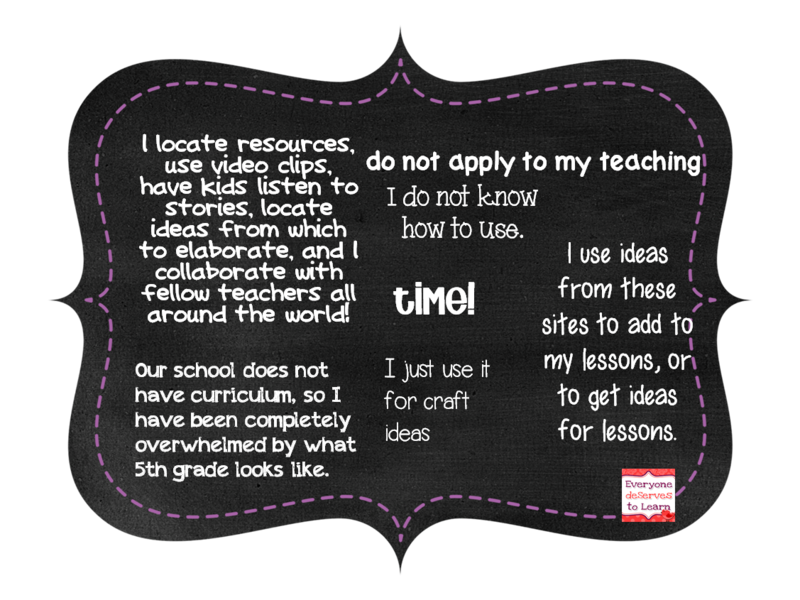 Have you ever been pin-spired to create a lesson or unit? Also, please head on over to my good friend Amy's blog and help her celebrate the big 3-0-0! (Followers, that is!) She's a great friend and has some amazing bloggers helping her out! In completing my action research for my administrative degree, I decided to focus on teachers' professional learning networks. At the beginning of my research, I didn't know to call it "professional learning networks." 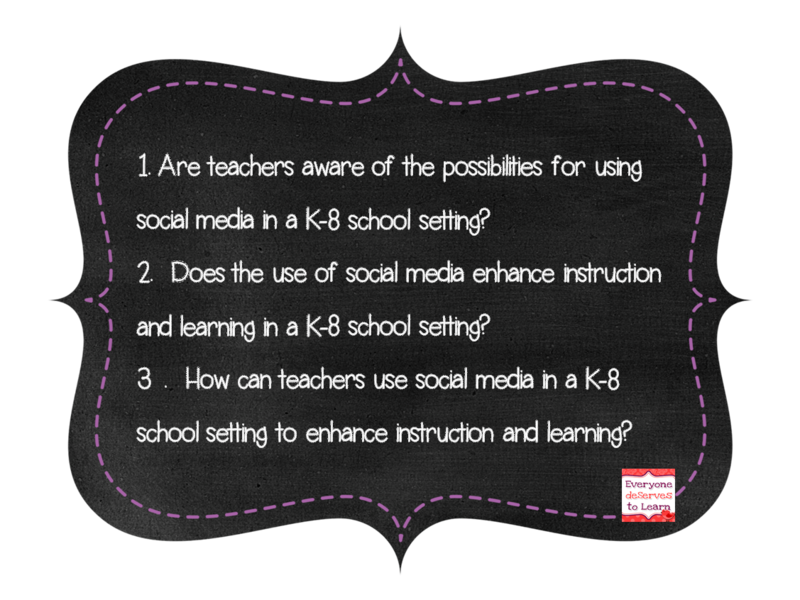 I called it "social media to enhance instruction." Well, that's what research is for, right? If you were following my blog back in December, I posted this pretty picture with a link to a survey. Thank you so much for taking it! I got so many great qualitative and quantitative results and I'd love to share them with you. Are you ready? 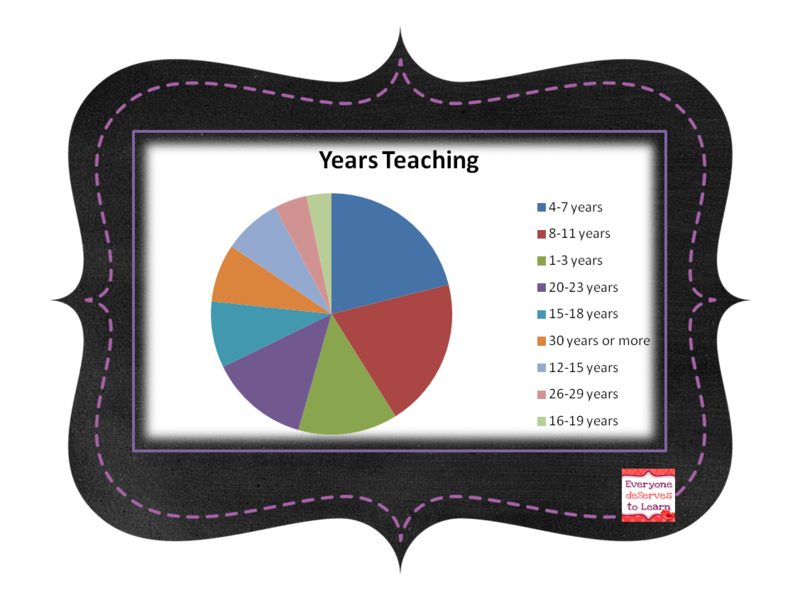 Here is a demographic chart about my 90 participants- the majority had between 4 and 7 years of teaching. Most were from New Jersey, and 97% were female. Here's the fun stuff! The results! Go ahead and take a look and then we'll talk. Ok! Lots of information there. I have to give a huge shout-out to my amazing Excel wizard husband. He helped me aggregate all the data and make it read-able and chart-able. For those of you still with us, in Figure 1 you can see that Pinterest and YouTube rank highest in use at 74%, with TPT just trailing at 70% use. Teacher blogs ranked a lot lower (47%) than my unofficial hypothesis (no hypothesis allowed in action research) which was that use would be a lot higher. I mean, look how many followers some of the top teacher blogs have! 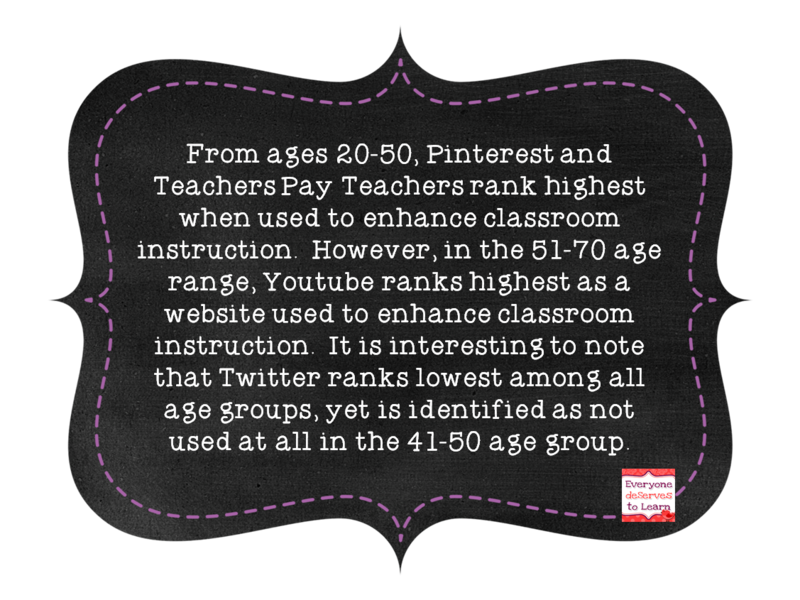 I thought the age difference when using Twitter was very interesting! 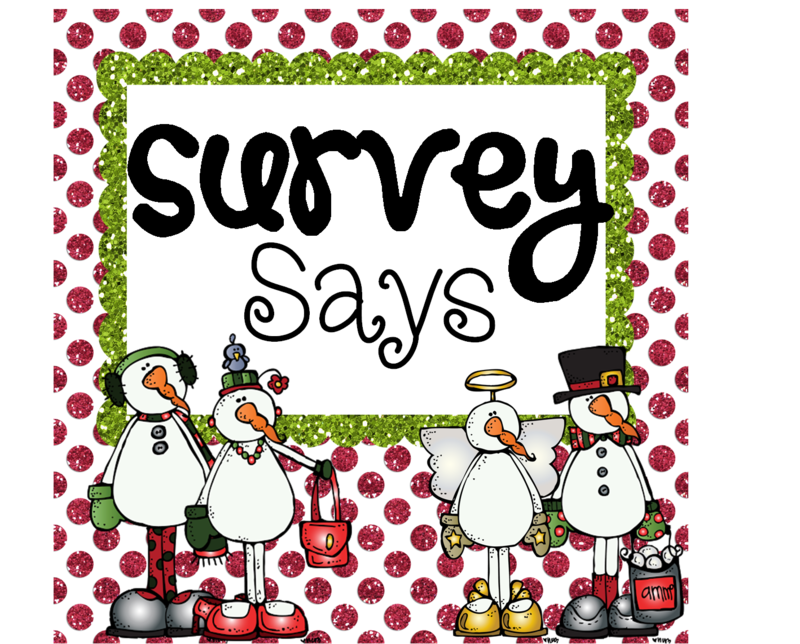 I would love to do the survey again with lots more teachers and see what happens. Figure 4 (below) reflects some qualitative data I selected to give general view of comments. 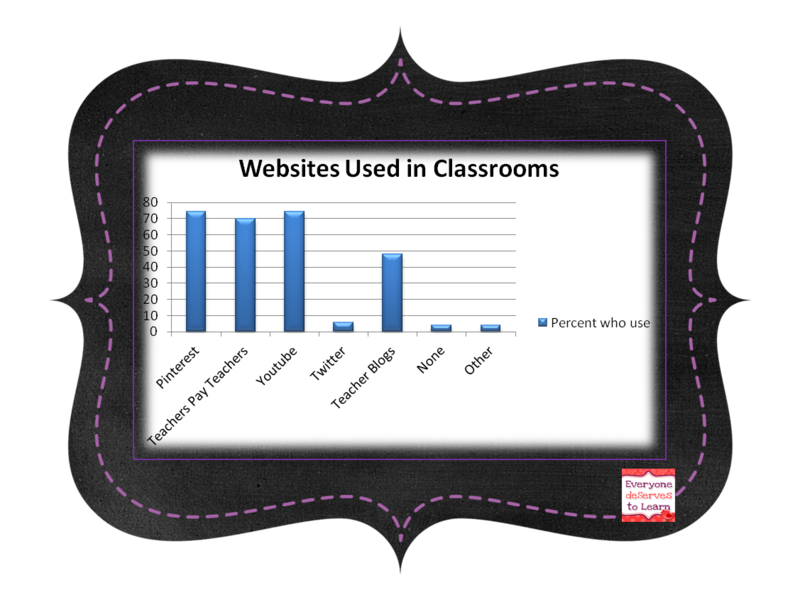 One I did not include in the graphic but is worth mentioning is "lack of technology." I know that is an issue in many districts in New Jersey. It was for the 5% of the teachers I surveyed who have zero professional learning network at all. A larger percent use only YouTube. An even larger percent use only Pinterest. How many teachers in your school do not have a professional learning network? I would say that 5% is about on target for my small school. So how can we bring teachers into the 21st century, just as we're expected to bring students into the 21st century? My action plan consists of professional development "for the teachers, by the teachers" using mentor teachers who self-identify as having a professional learning network, who can use that network as an example to train their colleages. 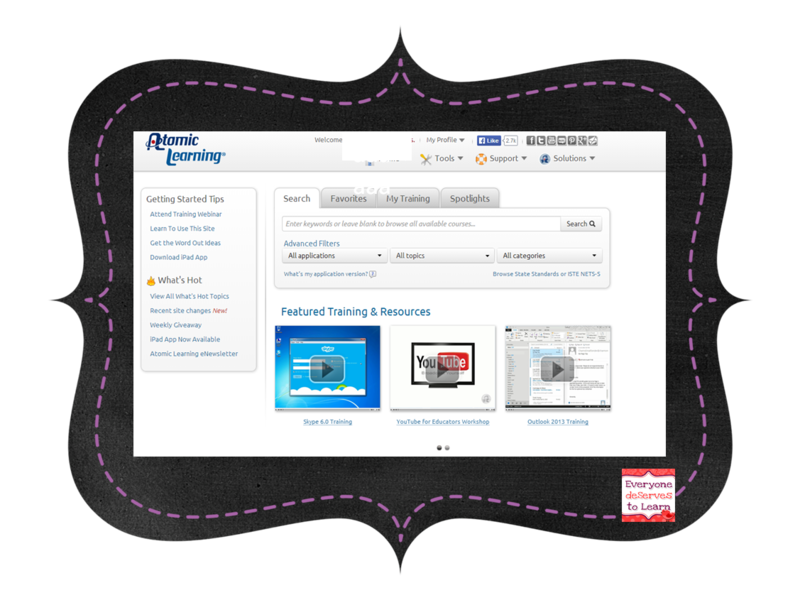 If there is a school where mentor teachers are unavailable, Atomic Learning (above) provides tutorials on many internet and software programs. 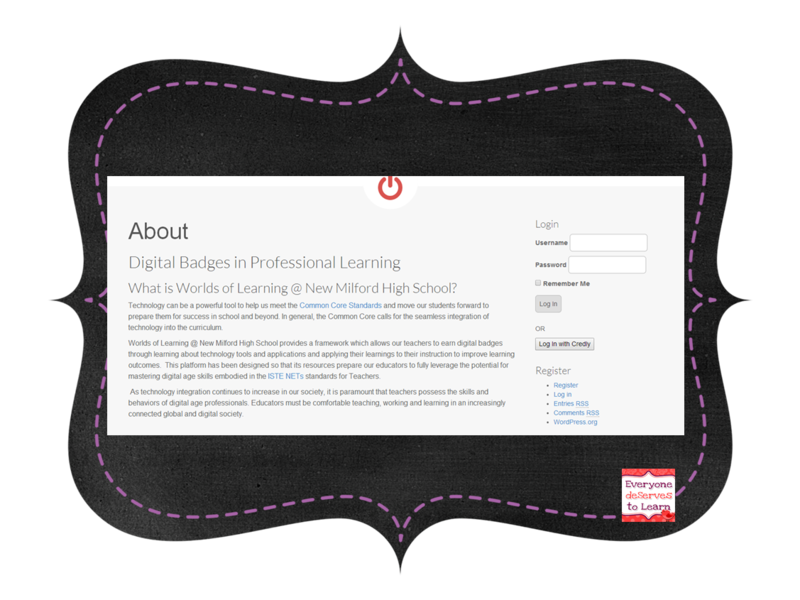 As an incentive, Worlds of Learning (below) provides digital badges which can be collected and displayed on a user profile. If you made it this far, thank you! I would love your feedback on my research questions, findings, or action plan. Do your colleagues have professional learning networks? I'd love to know! Do you teach Aesop's Fables? If not, what are you waiting for? It's one of my very favorite units to teach! and common core standards just waiting to be addressed. This unit has everything you need to teach about fables- go check it out at TPT! 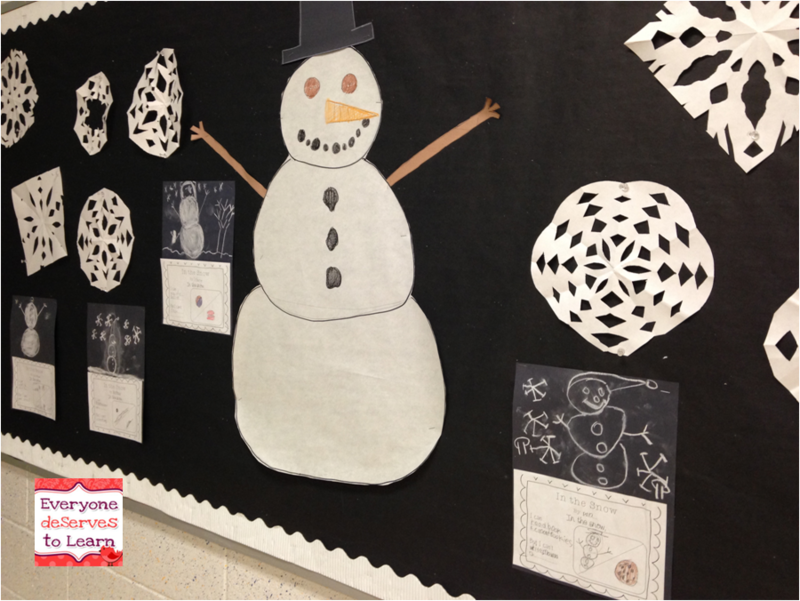 We are reading Snowflake Bentley in 4th grade, and one day this week it started to snow. I had the kids grab their coats and we ran outside. Luckily, the flakes were fat and fluffy, and stuck to the kids' hair and coats, which was exactly what I wanted. Thank you, Mother Nature! I love these pictures! 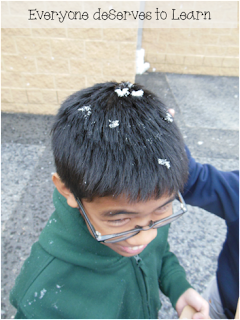 I let them run around for a few minutes, then we gathered in a circle and counted how long it took for a snowflake to melt once it hit our hands, vs. our coats or our hair. 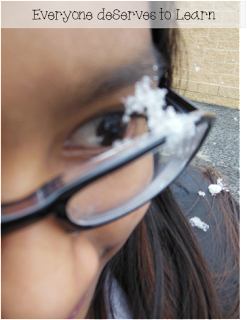 It could not have been better timing, because just the day before we had read and watched about how snowflakes are formed. The kids were full of science and math and language arts vocabulary all rolled into ESL. I <3 teachable moments! 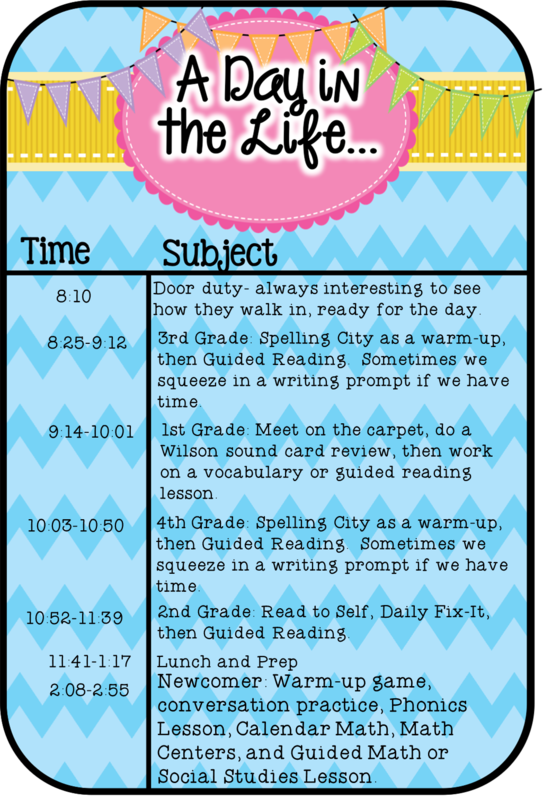 Ever wondered what it's like to teach 5 different grade levels throughout the day? I'm linking up with Amelia from Where the Wild Things Learn to show you what I do all day! 1. I actually like door duty! I mean, except when it's freezing of course. I feel like you get to know kids' idiosyncrasies that way and they appreciate the extra smile or good morning when they need a pick-me-up. 2. 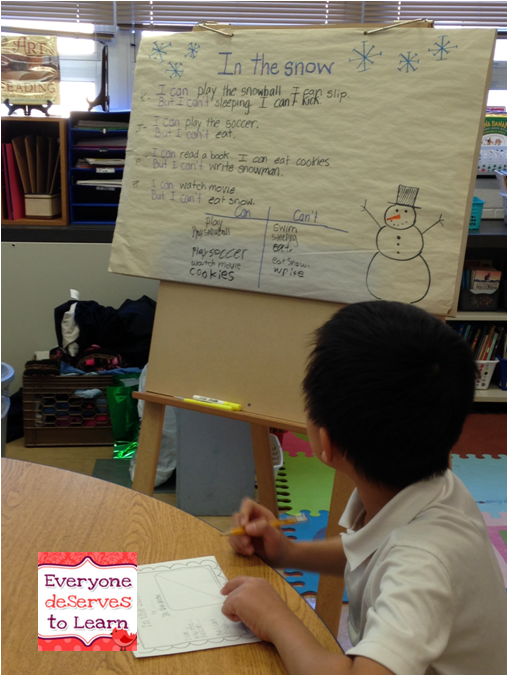 3rd Grade: I have 3 high-proficiency students and 1 newcomer, so I have Spelling City set up with lists assigned to each student, and they go on and complete one or two activities per day and take the test on Fridays. I used to do spelling as a teacher-centered activity, but then I bought the premium membership to SC and never looked back! Right now we're reading Andy Shane and the Very Bossy Dolores Starbuckle and learning to take Cornell Notes. 3. 1st Grade: I have 2 Newcomers- (a 3rd grader and a 4th grader) in with my first graders, and it's working out really well. They are uninhibited to speak in that class as compared to their same-age classes, and the little kids look up to them. I follow our school's basal series guided readers for the most part, unless it's a dumb one with no educational value, in which case I make my own unit. 4. 4th Grade: This class is very similar in structure to my 3rd grade class, so my lesson plan is almost the same, just with a different book for guided reading and a different word list. 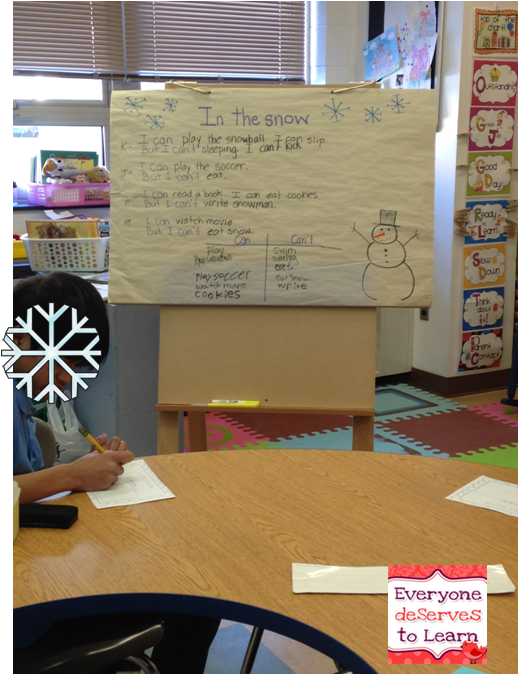 Right now we are reading Snowflake Bentley and doing some non-fiction writing. 5. 2nd Grade: I have two sweetheart girls in this class- we just read The Three Billy Goats Gruff and did a Reader's Theater. I have a lot of flexibility here since it's just three of us. 6. Lunch/prep. I eat by myself a lot, typing with one hand and scarfing down food with the other. Most of the time I'm prepping for my newcomer class which takes all the energy I have. A few times a week I meet with my teaching partner, and we try to figure out how to save the world make ESL better in our school. 7. Newcomer. I've blogged a lot about them, and I am constantly amazed by the progress they have made in just a few short months. We have a very structured class, but the repetition with which we follow our routine has helped them learn so much necessary academic and social vocabulary. I'm proud of them every single day. So that's my day! What does your day look like? Link up with Where the Wild Things Learn! My first graders are working on action verbs next week, so I whipped up a little foldable and assessment to go with the lesson. It's differentiated for different reading abilities/proficiency levels. Click any picture to grab it from TPT. While you're there, check out my brand-new Diary of a King- MLK Jr. Historical Fiction Mini Book. I'll be working on this with my 3rd graders. I know they're going to love it! One Year Blog-i-Versary Giveaway and Sale! Happy anniversary, friends! 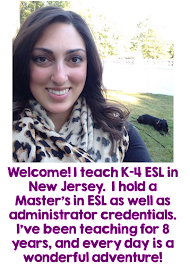 One year ago I sat down at my computer ready to share my ideas about teaching English Language Learners, and it has been an amazing journey. I made friends from all over: Kansas, Ohio, Hawaii, New Zealand, California...just from sharing ideas about teaching! Thank you for your support, comments, feedback, and love! 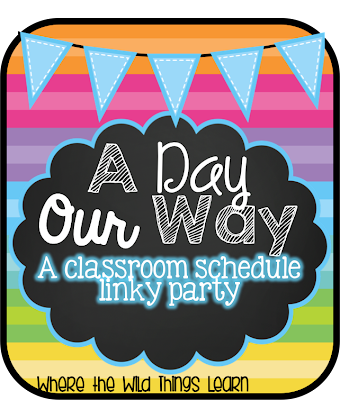 To celebrate, I gathered some of my best teacher-blogging friends together for a giveaway! My store will also be 20% off all week. Look at all these fabulous teachers! I would be happy to sit in on any one of their classes even for 15 minutes! I'm so happy to call them friends. Prizes from Everyone deServes to Learn, Conversations in Literacy, Tailor Made Teaching, Just Wild About Teaching, Eclectic Educating, Beach, Sand and Lesson Plans, and Lucky to Be in First. Prizes from Everyone deServes to Learn, Ladybug's Teacher Files, Fifth in the Middle, I Teach. What's your Superpower, Lucky to Be in First, and Teaching Tales Along the Yellow Brick Road. One winner for each pack will be chosen on Friday- you can enter every day! Thanks for participating- Good luck! Before Christmas I taught an introductory unit on measurement, just to the nearest inch. That led to comparing items as shorter or longer, which eventually led to greater than and less than. I have found with my newcomers that concrete visuals are best, and abstract concepts need to be left for a time when they have greater language skills. Comparing numbers is concrete and something they do pretty well at! They also loved tracing each other on butcher paper to see who was longer and who was shorter! But that is a post for another time. First, we visited our good friends Annie and Moby to learn the basics about comparing numbers. My students say, "Moby, yes!" every time they see me log in to Brainpop. I love that Brainpop has "chapters" that let you stop and explain, or pause and check for comprehension throughout. It's hard to do that in youtube sometimes. We practiced comparing one digit numbers on our individual whiteboards until we got the hang of it. I do not teach greater than/less than using the alligator, I teach with the trick that < looks like an L. So L = less than, and then we make a big > with our arms for greater than. Using TPR previously in class helped them to be able to remember the hand symbols since they were familiar with using them for other vocabulary. Here are some of the games we used to practice- I really like the games from Sheppard Software. This one is my favorite because it just uses the symbol, so the students can do it completely on their own. It also is SO very satisfying to shoot the fruit! This one was great when we had to review the words Greater than (G) and Less than (L). I practiced with them first using whiteboards, and just had them write G or L on the board instead of the symbol. I'm also getting in some beginning sound practice here! This one is good too, but the directions at the top are a little small- my concrete thinkers want to do the same thing over and over again so they didn't always look up to see if the direction had changed. I was pretty happy with their ability to compare numbers, but knew I needed one closing activity. I was browsing the TPT catalog for an assessment and came across this little gem. As I was printing, I thought...wouldn't it be fun to make this a hallway hunt? And then I thought...but it's going to snow tonight. Wouldn't it be fun to have a snowball fight? So I quickly put all the equations from the sort on paper and crumpled them up. 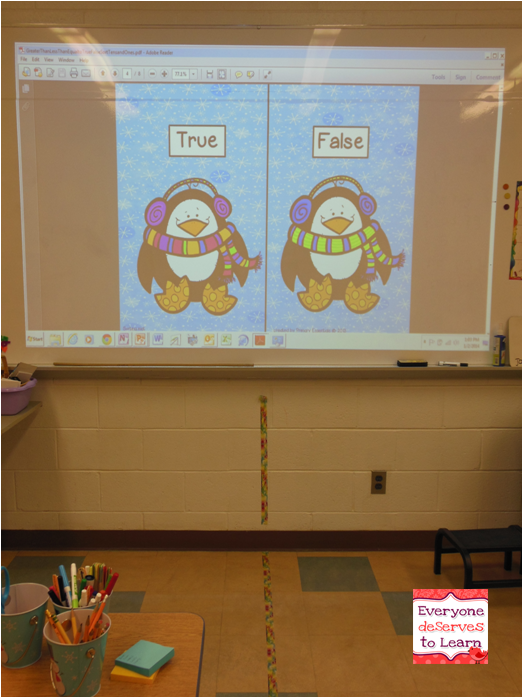 Then I projected the cute Penguin True/False sorting mat onto my screen and taped a line down the middle of the room. I divided my class (of 4) into two teams and explained the game. Now hold on, because remember I teach newcomers. So explaining requires a whole lot of sign language and I may or may not have had to show them the clip from Elf where Buddy throws the snowballs super fast. But you probably won't have to do that! They had 10 seconds to throw as many snowballs as they could at the other team. We had a do-over because it was too cute not to. 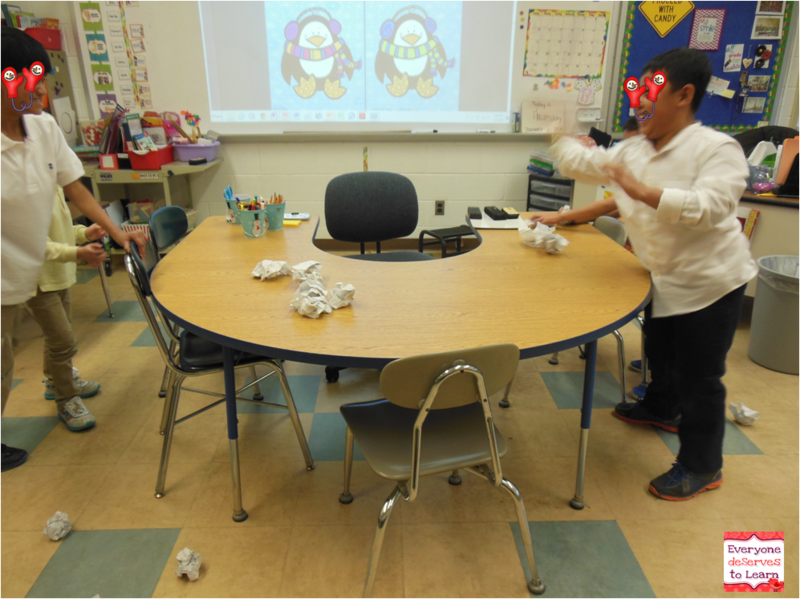 Then each team had to open a snowball one by one and decide if the equation was true or false. They had to stand in their spots (thank goodness for the blue squares on my floor!) and shoot to the Penguin. 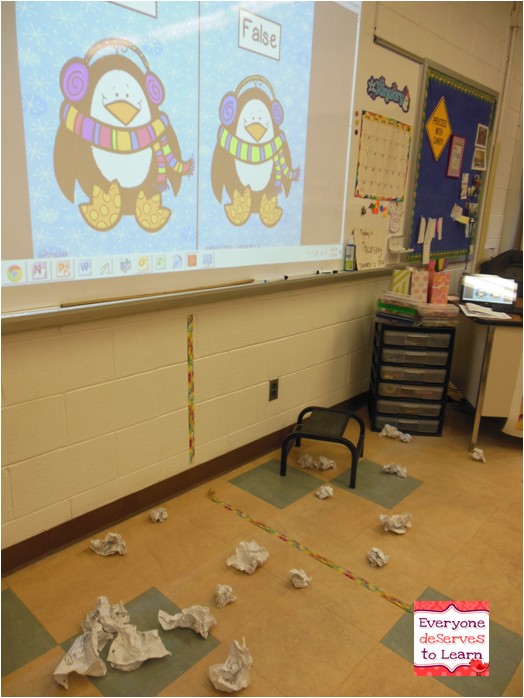 Some of my smarties figured out aerodynamics and tried to twist the snowballs so they would fly better. 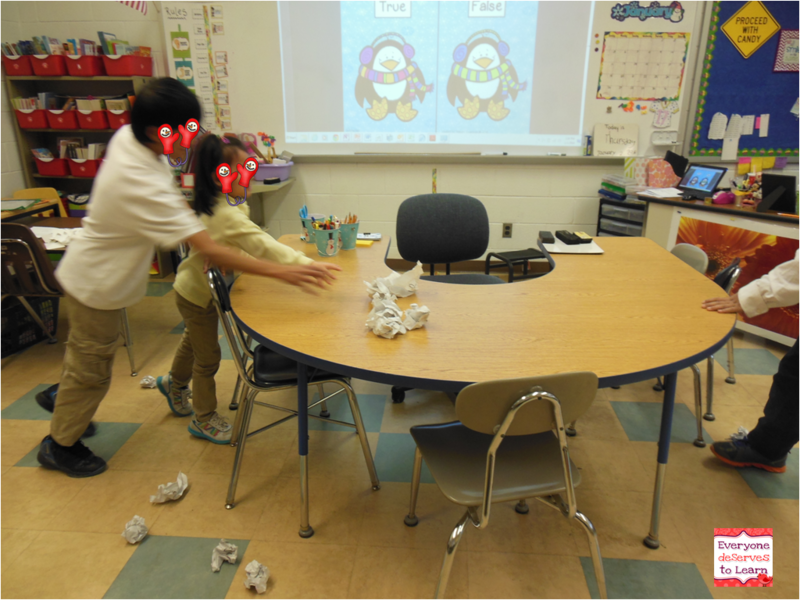 They were so elated to throw paper at the board, and they had no idea they were practicing comparing numbers! We'll round out our comparing numbers unit with the cut and paste sorting from Primary Essential's unit.